For objective reasons, no Ukrainian president can effectively solve any of Ukraine’s internal or external problems without the establishment of normal relations with Moscow. Candidates for the presidency of Ukraine, having reached the end of the pre-election race, regularly compete to outdo each other in demonstrations of their commitment to European integration and hostility to Russia. To a significant degree, their performances are not even directed at their own Ukrainian voter, but to the address of Western observers supporting the thesis that “Ukraine is not Russia.” Indeed the presence of anti-Russian sentiment, unfortunately, has for the West long been synonymous with a commitment to democracy. Although the substitution of these concepts here is obvious, nevertheless, experience shows that the West is prepared to shut its eyes to a lot in exchange for a critical attitude towards Russia – even neo-Nazism. This is not the point, however, but rather the fact that all of this, to a certain extent, no more than a spectacle for outside observers. Indeed the overwhelming majority of Ukrainian politicians are in one way or another tied to Russia, either presently or in the past. And it is not that they were all “born in the USSR,” this affecting their mentality to a significant degree. And it is not even about their biographies almost always intersecting with Russia, them having relatives, friends, and acquaintances there. It is about interests. Just take the main pretender for victory – one of the Ukrainian oligarchs Petra Poroshenko. It is said that it is this candidate specifically that the Americans are pushing strongly, banking on his long-term loyalty. As a response to that vote of confidence Poroshenko actively criticizes Russia in the course of his election campaign. However it is no secret to anyone in Russia or Ukraine that the confectionary magnate Poroshenko has made his fortune thanks specifically to business in the Russian market. More than half of the products of the Roshen Corporation, Poroshenko’s core business, are sold on the Russian market. Moreover, Poroshenko has businesses located directly in Russia. As an example, one of his holding’s largest factories is located in the Russian Lipetsk. Furthermore, a rather significant part of his business goes to the markets in Belarus and Kazakhstan, which are in the customs union with Russia and are planning for further integration with Moscow. There is also Kyrgyzstan, Tajikistan, and Armenia, which are candidates for entrance into the integrative union. In addition Peter Alexeevich had and still has business interests in Crimea, which, in one way or another, are now located under the jurisdiction of Moscow and it is impossible to ignore that fact. Can Poroshenko ignore all of these circumstances? Not likely. Indeed, Ukraine has never been the democracy that it wanted to show to the whole world. It will hardly become one now, since, in essence, what is happening in Kiev is a “reset” of the oligarchy, the traditional post-Soviet system of governance where all politics essentially boils down to oligarchs competing over spheres of influence. It is precisely against this that Maidan protested so loudly. But the opinion of Maidan does not interest anyone now, as the process of the new redistribution of what remains of the Ukrainian economy and resources has begun. Money and interests will decide everything. The distinction from the previous period is that, since Maidan, Ukraine has become awash in weapons and the value of human life has dropped considerably, so now every self-respecting oligarch has his own personal army, turning into something like an Afghan field commander. This persuasion will allow each to more effectively defend his interests in the course of the “reform” of the Ukrainian economy. Poroshenko’s closest rival, the former Prime Minister Yulia Tymoshenko has her own “romance” with Russia. 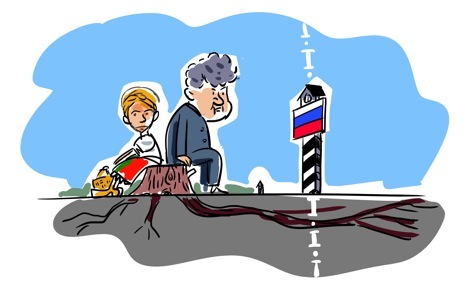 Actually, the battle between these two candidates, apparently, will become the main intrigue of May 25th – and the second round of elections if Poroshenko fails to win the first time around. Some in Ukraine are of the opinion that Yulia Tymoshenko first became, at some point, one of the richest people in Ukraine specifically through gas contracts and other business projects with Russia, and only later became a leading political figure competing for many years for the post of president in this country. In general, the entire Ukrainian elite grew up on Russian money to some degree or another. Admittedly, this did not always occur at the behest of Russia or in accordance with its interests, but it would not be right to drop this fact. Tymoshenko was long involved in a variety of joint Russian-Ukrainian business schemes. And it is well known that even though she had been one of the leaders of the Orange Revolution of 2004, which was carried out under the slogan of European integration at that time as well, it was she, namely, who established quite constructive relations with Vladimir Putin. And it was Tymoshenko specifically who signed with Putin the very same gas deal that the current powers in Kiev are calling “unjust” and refuse to pay money on. Meanwhile, the fact that Tymoshenko was factually Maidan’s chief “icon” despite being the one who signed the “unfair” agreement with Russia is wholly characteristic of Ukrainian politics. The protesters demanded her release. The current Prime Minister, Arseniy Yatsenyuk, was her confidant. Even Europe was indignant. However, as soon as Tymoshenko was released, she started to interfere with the new victors who are now actively pushing her out of big politics, offering her the role of honorable exposition in the Ukrainian “Struggle for Freedom” virtual museum. In response, Tymoshenko threatens to create a new “maidan,” not seeing that such a thing could bury Ukrainian statehood, which is already cracking at the seams, for good. It is thus important to understand that this is the main principle of Ukrainian politics: there are no principles, only interests. However, returning to Russia, it is necessary to add here that, for objective reasons, no Ukrainian president can effectively solve any of Ukraine’s internal or external problems without the establishment of normal relations with Moscow. There are a huge number of objective reasons for this, alongside the avarice and un-principledness of Ukrainian politicians. Moreover, having normal relations with Russia is a natural position for Ukraine which fits her strategic interests. For this basic reason, Ukrainian politicians haven’t the slightest chance of ignoring their past, present, or future ties with Russia, regardless of the fact that they are talking about it. The writer is the Director of the Political Situation Centre of Russia.